Land molluscs are not a conspicuous feature of the Assynt fauna, with the exception of garden snails Cornu aspersum, which have increased to pest proportions locally, and the almost ubiquitous large black slug Arion ater. However, over fifty species have been found in the parish, a third of them slugs. 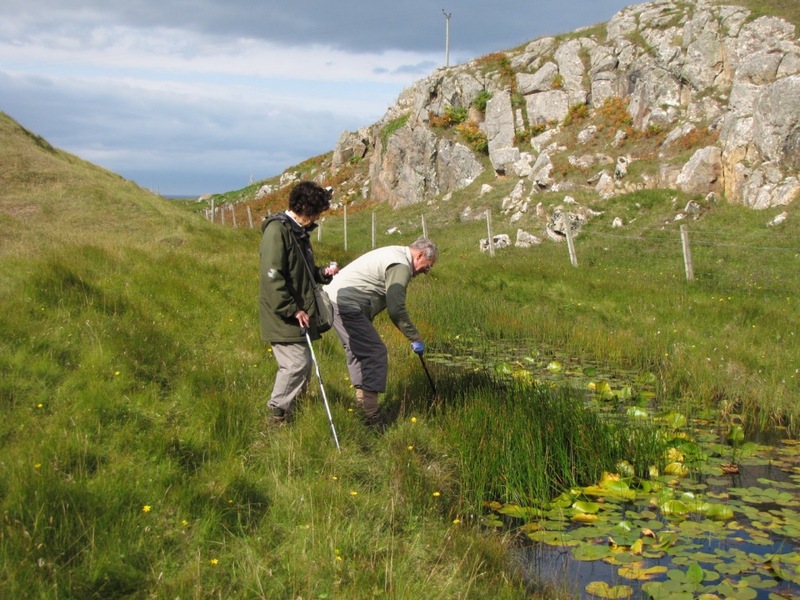 Just two conchologists (naturalists with a special interest in this group) are known to have visited this area in the last twenty years, Dr Adrian Sumner in 1999 and Dr Gordon Corbet in 2002. Adrian has also kindly identified the results of casual collecting by myself and others. I was, therefore, pleased to be able to act as local guide to Adrian and his botanist wife Dr Barbara Sumner on a brief visit in early September 2018. He will be sending me, in due course, a full list of his finds, but I thought that I might, meantime, post this brief account of their visit to Achmelvich, Clachtoll and Stoer on 2nd September 2018. Snails proved very difficult to find, probably because of the very dry weather earlier in the year. 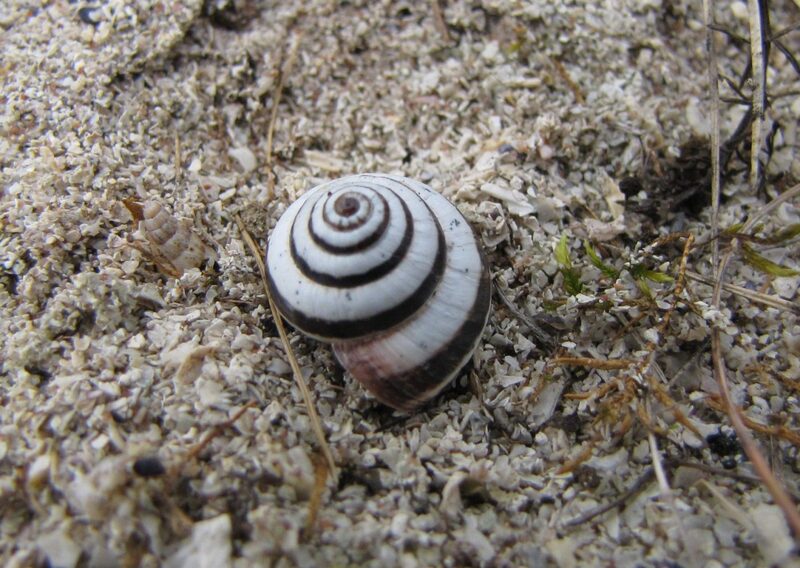 Exceptions were myriads of the striped snail Cernuella virgatain the sandy grasslands around Achmelvich Bay (NC0524), with smaller numbers of the spire-shaped pointed snail Cochlicella acuta. 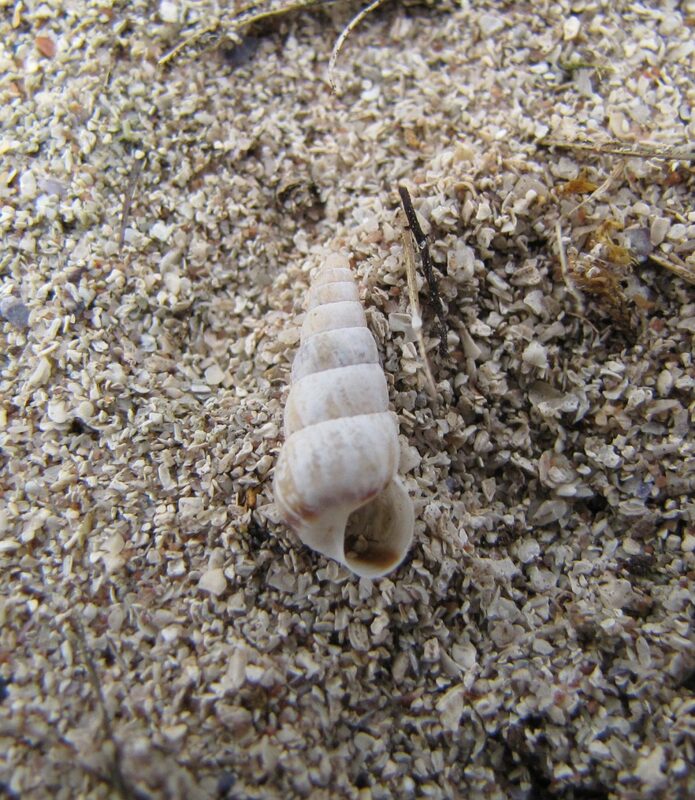 The calcareous shell content of the sand suits these coastal species. We also found the garden snails wedged into fissures in gneiss outcrops off the track to Alltan’abradhan that featured in an earlier note. Adrian tried for freshwater species in the lily loch east of the track, but his catch was disappointing. Slugs were more forthcoming, since they shelter during the day under wooden boards and other man-made debris. 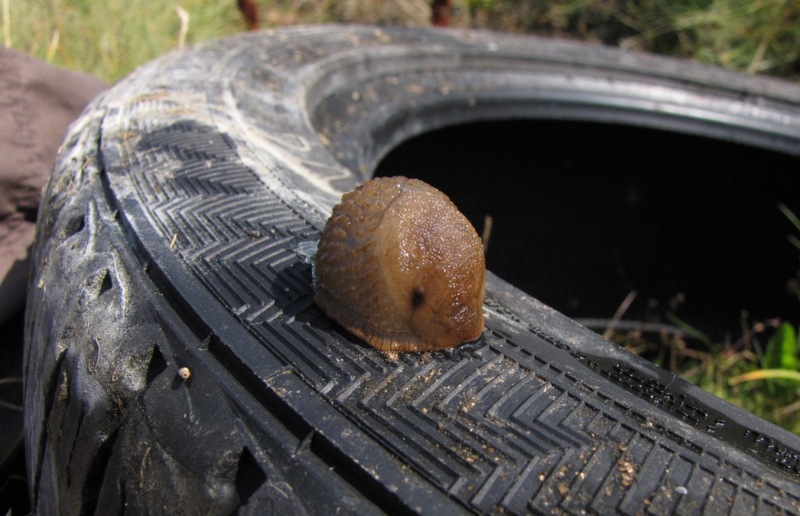 An example was a large slug found under an old car tyre, one of a number scattered over a small area of the machair, relating perhaps to some equestrian activity. This pale relative of the large black slug had the characteristic dark shading around its breathing pore of the vulgar or Spanish slug Arion vulgaris. The species, which can attain a length of 140mm, probably hails from southern Europe. It was first reliably recorded from the British Isles in the 1960s and appears to be spreading, although many of the records only date from the last decade. This is certainly the first record from Assynt and maybe from north-west Scotland, but it does take an expert to recognise it. One of my contributions to the day’s search was unearthing a pallet buried in nettles just outside the wall of the Stoer cemetery (NC0428). On it was a single example of the smaller smooth jet slug Milax gagates, for which there is one previous local record. I am looking forward to hearing from Adrian what other molluscs we found.